To visit my sister, I can take a train, a plane or I can drive. I've done all three and honestly, they each take about the same amount of time, start to finish. Driving is the most wearing on the body because you're stuck in a car for the whole 8-10 hours and when you stop, you know it just means more time on the other end. But, you have your own vehicle and more space to bring stuff and you feel no hassle for time because you leave when you want to. Flying is just about as stressful because of security, cramped quarters on the plane and the need to get there 25 hours before your plane arrives. I live 1.5 hours from either airport I would take, and my sister lives about an hour from either that I could arrive at, so by the time all is said and done, it's 8-10 hours. The train is the least stressful. The actual trip is less than 7 hours, but when you add the 1.5 hours for me to get to the train station and the hour or so from the train station to my sister's it still ends up being 8-10 hours. But much less stressful than flying. 1) you can pick your own seat. Some of you know that picking your own seat is the very reason I will not fly Southwest, but it's different. On a train, you can pick your seat but if another one opens up, you can move. If a seat opens up mid flight, well, I don't think anyone's moving anywhere if that happens. And if a seat should open up in your car? Well, I just don't want to know. a) stretch your legs sort of diagonally across the empty seat and put your head back against the wall and close your eyes. You couldn't probably loll your tongue out if you dared to really convince people you are asleep. b) look extremely busy with a lot of paperwork that takes up your lap, the seat and covers your laptop that you have on the drop down table. I have the luxury of being short enough that I can actually sit with my back against the wall and put my legs out completely, and they don't hang off the end of the armrest. Score one for the shorties. 3) at no point during a flight would this be allowed: A woman takes out her biggest suitcase, you know the kind that you can bring 2 of on an international flight. Pretty big. So a woman takes it out, puts it in the middle of the aisle and starts completely repacking. While the entire train is trying to walk to the cafe car, which is the next car ahead of us. I am also certain this would not happen if drove because, well, you don't have an aisle. Unless you are in the motorhome and then it wouldn't be at all unusual. Well, in our motorhome it would have been unusual because we didn't use suitcases, we brought our stuff out to the motorhome in paper bags. 4) somewhat steady wifi. They claim some day we will have it on planes but I am not holding my breath. I say somewhat because it comes and goes and is pretty slow. It was a beeotch with the ipad but with my laptop, it's just a test of my patience. Driving alone and having wifi would just be a disaster. 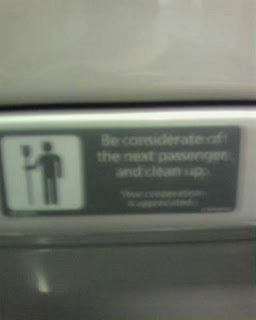 5) due to my total comfort addressing crowds, there's something about the seat height of the train that makes me have to hold myself back from standing up to survey the crowd and start telling people what to do. On a plane, this would never happen because a) they are so cramped and b) there are flight attendants who would probably frown on that. And again, in your car you don't have an aisle and if you felt the need to address the crowd in your motorhome, well then so be it. 6) fairly luxurious bathrooms. I say this because we all know how awful plane bathrooms are because they are so small. Plus, you have that damned accordion door. On the train, each car has a handicapped bathroom and a non handicapped bathroom. The handicapped has lots of room. Both have sliding doors, so even if you're in the small one, you can get out without having to do the sideways limbo around the door. And unless you're driving in the motorhome, no bathroom for you in your car. If you are in the motorhome, well you could go to the bathroom while stuck on a bridge and live to tell the tale. We know someone who did just that. 7) steady, flat surfaces and no risk of things falling off. You can have your tray table down and your seat back for the entire trip on a train. You only go straight so there are no sharp turns to send things flying. Try doing that on a plane or in a car! 8) and the real reason I take the train? Because the devil himself rides this train. Be considerate of the next passenger and clean up. I like the thrill of being afraid of making a mess. I am in total agreement on this one (plus the fact I don't own a car since moving to London), trains are the best! None of that stupid early check in that's required of flying. Plus train stations are so easily accessible! Total win in my books.